Millions of runners around the country are interested in special experiences, whether it means running a bucket-list event like the world's largest marathon (New York City), or competing in beautiful and challenging locales such as Rome or Death Valley. There is no one better to guide these runners than Bart Yasso. As Chief Running Officer at Runner's World, he's run more than 7,000 races, on all seven continents, at every conceivable distance. Whether it's a 5K or half-marathon, he's done it all, and in Runner's World Race Everything he presents fifty of his favorite races. Yasso shares tips on how he trained, the particularities of each course, and what specific lessons he learned and insights he gleaned about how to run your best in each race. Bart will teach you how to train and what to do on race day to make the best use of your training. 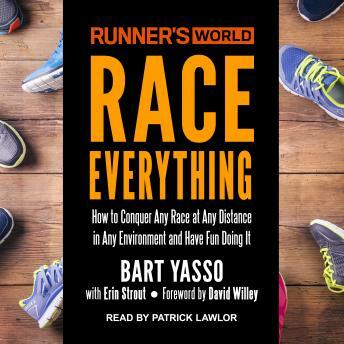 The book will give you everything you need to know to succeed at the most popular race distances, alongside Bart's one-of-a-kind advice on his experiences at popular destination races so you can be inspired to tackle running's signature events. You'll also learn Bart's methods for winning the greatest race of all-longevity-so that you can remain healthy, fit, and able to race for decades to come.